Thanks to ground – breaking diabetes stem cells treatment research, scientists have moved a step closer to a cure for Diabetes. If all the research being undertaken about stem cells diabetes treatment, thousands of diabetic sufferers could soon be free from the burden of daily insulin injections. In a study, published today in the Journal of the American Medical Association, fifteen diabetic individuals with type 1 diabetes overcame a dependence on insulin after being treated with their own stem cells. In future, the same procedure could be used to help the 300,000 patients suffering from the condition in Britain. Diabetes type 1 is caused when the body’s immune system destroys insulin-producing beta cells in the pancreas. Diabetic patients have to regularly inject themselves with the hormone insulin to control their blood sugar levels. In the study undertaken by American Medical Association – the diabetics’ immune systems were suppressed using drugs to destroy the white blood cells attacking the pancreas. They were then given an injection with a chemical to ‘loosen’ stem cells – immature cells that can be transformed into different adult cells – from their bone marrow. These were filtered out after being injected back into the patients’ bloodstream. After the diabetes stem cells treatment, 14 of the 15 being tested were able to put away their injection pens after losing their insulin dependence. For 35 months, one diabetic patient has not had to inject himself with the hormone. Researchers conclude that the stem cells developed into white blood cells, which, in turn, did not attack the pancreatic beta cells. Despite the positive results, the scientists warn that before the diabetes stem cells treatment procedure can be made available much more work needs to be done, adding there could be other reasons why the diabetic patients no longer rely on insulin injections. They admitted that they would wish to avoid false hope based on the very preliminary nature of these results and that the stem cells may have developed into beta cells in the pancreas or helped to stop the existing beta cells being destroyed. They also pointed out that the study included only 15 patients, aged between 14 and 31, whose progress was not monitored for an extended period. Because of the lack of conclusive evidence, it is not known if more stem cell injections will be required at a later date. 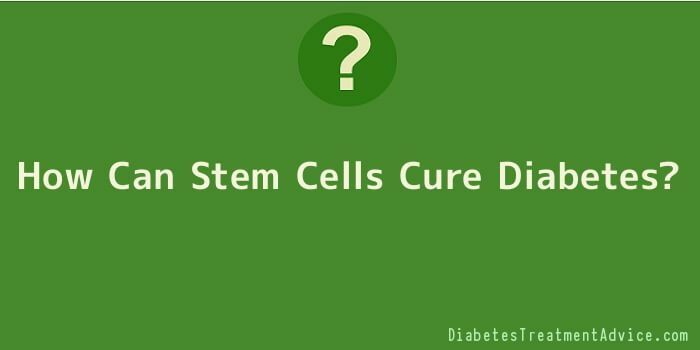 The diabetes stem cells treatment research was different as compared to other medical trials as there was no comparison with patients left untreated or given only the immune suppressants. All the issues mentioned above need to be addressed through more research before there are any conclusive findings in this area. Studies have already shown that as bone marrow is full of stem cells, bone marrow transplants in cancer patients appear to reverse certain autoimmune disease such as type one diabetic individuals. Treating patients with stem cells from their own blood has also been found to benefit individuals with a range of autoimmune diseases, including rheumatoid arthritis and Crohn’s disease.